Sure, the Planet Snoopy area is adorable, and the park offers plenty of fun for guests of all ages and levels of bravado; but Kings Dominion is primarily about the thrills. In fact, it is one of the theme parks with the most number of roller coasters in the world. Screams emanate from every corner of the park as riders challenge its wild arsenal, including one of the world's tallest thrill machines. 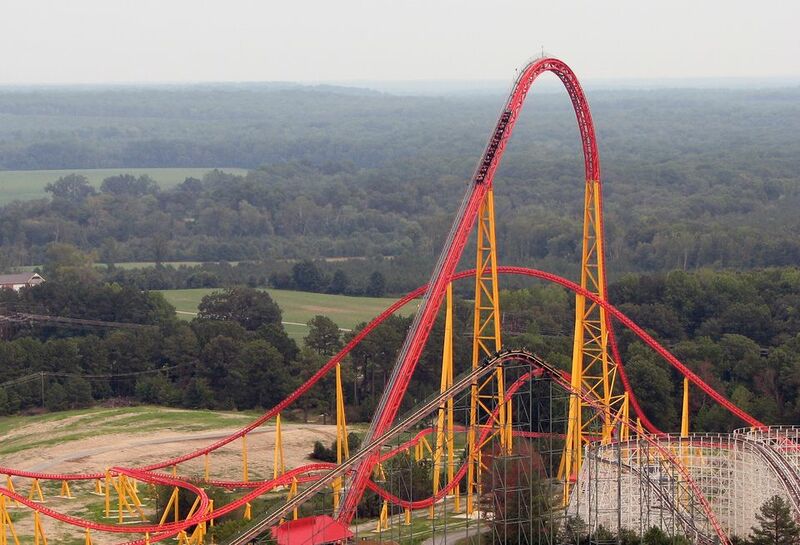 Introduced in 2010, Intimidator 305 reaches a height of, yup, 305 feet, drops at an incredibly steep 85 degrees (just shy of straight down), and accelerates to face-melting speeds. Themed to racing car legend Dale Earnhardt (who had the nickname, "The Intimidator"), the coaster is all about crazy speed and intense G-forces. Kings Dominion has an impressive trio of launched coasters. Volcano, The Blast Coaster uses magnetic induction to snake riders in and out of a belching molten mountain. Suspended from the track, the inverted coaster features two launches and reaches impressive speeds of 70 mph. The queue for the indoor launched coaster, Flight of Fear, winds through a flying saucer. The ride itself doesn't do much to tell any kind of story. Like Disney's Rock 'n' Roller Coaster, it does have a pulse-quickening launch into darkness that is a wild rush. But after accelerating to 54 mph, the short ride peters out. The park also offers Back Lot Stunt Coaster, a family launched coaster themed to Hollywood special effects. Among Kings Dominion's other coasters is Twisted Timbers, a hybrid wood and steel model that opened in 2018. As it has done with other old, rough wooden coasters, ride manufacturer Rocky Mountain Construction retained much of the wooden base of the past-its-prime Hurler coaster, ripped out its traditional wooden tracks, re-profiled the ride, and added the company's patented IBox steel track. In 2018, the park also renamed its old school, twin racing woodie that had been known as Rebel Yell to "Racer 75," (after the year it first opened. The park's third wooden coaster, Grizzly, is a double out-and-back ride nestled among a thick forest of trees. While the natural setting for Grizzly is great, its ride is ride mostly lackluster. Other ride highlights include Delerium, a swinging pendulum ride, Drop Tower, a spinning freefall ride that climbs over 300 feet, and WindSeeker, a swing ride that soars 301 feet in the air. Slightly less intimidating rides include the Shenandoah Lumber Company log flume, the Boo Blasters on Boo Hill interactive dark ride, and the Eiffel Tower, a facsimile of the Paris original with an observation room at its 315-foot apex. Long lines and hot days do not make great bedfellows, and the popular Kings Dominion can get very crowded. You may want to consider visiting on weekdays, during overcast weather, or in the off-season to avoid tedious waits (especially for the slow-loading Volcano). If you end up visiting on a crowded day, consider springing for Fast Lane, the park's skip-the-lines program. There is an additional fee above the regular cost of admission. While the Soak City water park is included with admission to Kings Dominion and sounds like it might be a great place to chill out on a hot day, it does not boast a large number of attractions and tends to get very crowded when the mercury rises. Doswell, VA (near Richmond, VA and Washington, D.C.). The physical address is 16000 Theme Park Way. I-95 to Exit 98 in Doswell. Kings Dominion is 20 miles north of Richmond, VA and 75 miles south of Washington, DC. Tickets to the theme park include admission to the adjacent Water Works water park. Reduced price for children (under 48") and seniors (62+). 2 and under are free. Discounted tickets and specials such as two-day tickets are often available online. Season passes are available. To purchase advance tickets, view operating hours, and more info, visit the official Kings Dominion site. The usual theme park suspects, including fast food franchisees such as Subway and Panda Express, and homegrown fast food stands that offer fried chicken, pizza, and fries are available. More interesting choices include Surfer Joe's, a seafood eatery with items such as a Shrimp Po'Boy, the BBQ joint, Wayside Grill, and the Mac Bowl, which offers customized mac-n-cheese dishes. In the spring, Kings Dominion presents Taste of Virginia, a food festival that features state-inspired dishes along with local craft beers.